Container gardening offers a wide range of gardening possibilities especially for those enthusiastic gardeners with limited space. Any container can serve as a planter as long as it can hold soil and have drainage, let your imagination go wild; but container gardening is not just filling a container with soil and adding random plants. There are a few planting tips to consider that will reward you with a healthy, long lasting planter all season long. 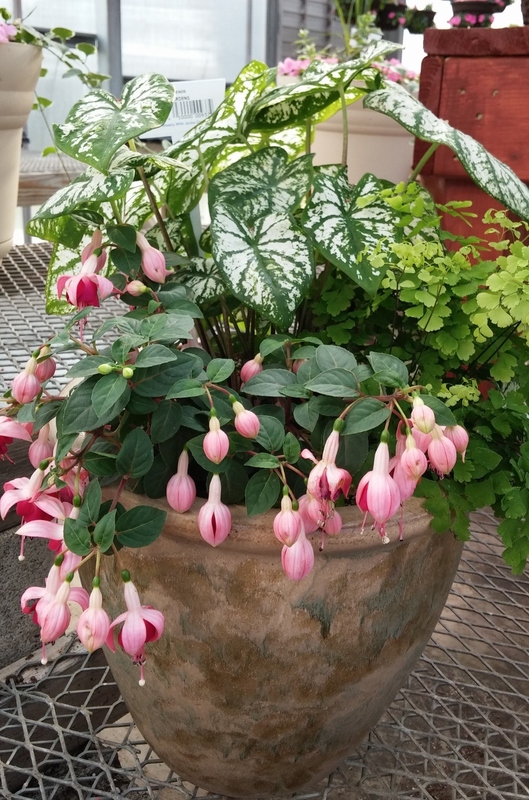 Choose plants that are compatible with size, color, light and moisture requirements. 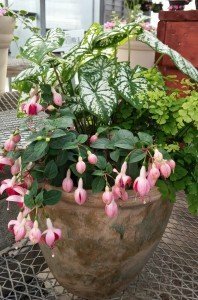 – Start with a container that is large enough to maintain the plant or combination of plants through the whole growing season. If the container is too small it will dry out much faster during the hot days of summer. The bigger the better-but also keep in mind that you may have to move it. Clay pots are heavier, porous and dry out faster than metal, plastic or wooden pots. I like the faux clay pots. They seem to fit all requirements. – Be sure your container has adequate drainage. Place a fabric filter or mesh over the drain hole and fill bottom of container with gravel, broken clay pots and peanuts to fill the space. Leave the top 8-10 inches to fill with soil. – Healthy plants start with healthy soil. Use the good well drained soil, or mix your own by combining 1/3 peat moss, 1/3 vermiculite or perlite and 1/3 organic material Fill the container 2 inches below the rim of the pot to allow room for planting and avoid overflow when watering. – To conserve moisture and reduce amount of watering add a water retaining polymer (Hydro-gel) to the soil. Soak the polymer before adding it to the soil and follow label directions as to how much to use. Do not use any water polymer when growing vegetables and herbs in a container. – Mix in a slow release fertilizer (Osmocote) that will feed your plants up to 4 months, enough to carry you through the growing season. Supplemental fertilizer may be required especially with vigorous growing vegetables as frequent watering will leach the nutrients from the soil. I built many large self watering containers from a website offering the plans, where one container is fitted into another after a small pond basket is attached to the bottom of the inside one. The completed project provides a water chamber on the bottom, with overflow holes to prevent overfilling, and a planters mix bed in the upper container where the pond basket, also filled with planters mix, extends into the water reservoir. Water is added through a pipe directly into the lower container. I have blossom end rot on many plants and suspect the watering situation. I added lime to the mix bed before planting. Any suggestions? I agree, it sounds like a watering issue. Blossom end rot is caused by uneven supply of water making calcium unavailable when the fruit is forming. Central Illinois questions about time of day to water and fertilize container grown tomatoes, peppers, zuchinni. Also what ratio of fertilizer. These containers are in full sun. The best time to water is in the morning, so that the plant have all day to utilize the moisture. In hot weather you may have to water twice a day-avoid watering in the evening if you can. Fertilize every two weeks with a balanced fertilizer 10-10-10 or recommended vegetable fertilizer. Look at the recommended dosage on the fertilizer label. I have container grown peppers. The leaves are turning brown around the edges only, as if they are burnt. There are a number of problems that can cause this symptom -not enough fertilizer, too much fertilizer, overwatering, underwatering, low humidity, air pollution and wrong ph. I would examine the first four(especially overwatering/underwatering) and see what you need to change. Can I plant pumpkins in a container? If so, when should I transplant it? Yes, you can start them in a container. In the cooler climate they should be started indoors around May and then planted outdoors when the weather permits (early June). Pumpkins are a warm weather crop and do not tolerate cold temps. This time of year, you can plant seeds directly into the ground. It may be too late for the cooler regions because they need 100+days to develop and produce pumpkins before the frost. In warmer climates you may still have a chance as the growing season is longer. I have obtained a couple of whiskey barrels from my local distillery. I was wondering if there was anything special other than cutting, cleaning it out, and letting it dry out that I needed to do to make them planters. That’s about all you need to do if you are using them for planters. You can also add some material into the bottom of the barrel to help with drainage and weight. A friend of mine suggested crushed cans, broken up clay pots – don’t make it too heavy or you won’t be able to move it. Whiskey barrels make great planters. Can someone please give me instructions on how to make planters out of discarded car tires? Thank you. Go to http://suite101.com “Felder makes a tire planter”. It has step by step pictures of the procedure. What fruits and vegetables can be planted in pots for city gardening? There are many vegetables and some fruits that can easily be grown in container. Vegetables such as peppers, tomatoes, eggplant, cucs, beans, lettuce, potatoes and fruits like strawberries, are easily adaptable to container gardening. The important part is choosing which ones you would enjoy growing. There are varieties that are specially bred to grow in containers and can be found in seed catalogs. Some of the important things about container gardening is maintaining moisture in the heat of summer and providing ample nutrients (fertilizer) which leach out of the soil when watering. There are great books on Container Gardening that can help you get started and the University Extension has some helpful publications as well.